Inspired by "Monet's Pond" in Gifu Prefecture, Japan. 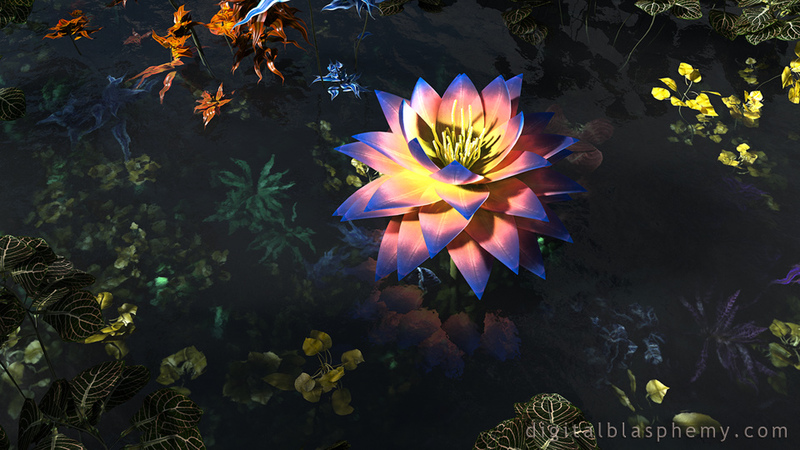 I added the lotus (petals modeled in Lightwave, model assembled in Plant Factory) to give the piece a central focus. "Serenity from the 2017 gallery"
Cleanse the mind of clutter, dust, webs of confusion. Focus on the flower. Look beyond the surface of the petal to touch the colours our Mother created through the hands of the artist. Great image! However, I'm using Windows OS. I can't get it to truly extend properly across 3 screens. It just duplicates. Only reason I didn't give it a 10. I am between this and Skygate for my next Thank You Card. I gave it a 9/10. I really like these simple stand-out floral types of artworks (that includes the classic DB blue mushrooms). It makes a great background. I love the way the plant stands out at you. Amazing attention to detail as. Colors really catch your eye! This one I can see as postcards, a poster, etc. I love the depth of the water....another one that captures attention. Thank you again! Beautiful piece... but from the title I was almost expecting a spaceship. The way the light catches the flower in the middle is very effective, it really stands out. 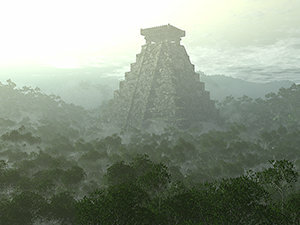 Although the image is of water and the plants that reside. The genius of focusing on the one and drawing the eye to it singular beauty was very artistic. It makes you appreciate the simplicity yet complexity of the water Flower. Wow you are truly amazing. God has blessed you with awesome talent. When I have friends come over they always comment on your pictures. They all are so breath taking. Keep up the great work. Nailed it Ryan, what a beauty! Love the emphasis and spot light on the central figure in this creation. I could expect to see such a lovely flower on Pandora itself. Just FYI, in gallery>>New this creation is entitled "Alpine Autumn" which slightly disturbs my serenity. And yet, I rated it a 9, even though I think the choices of too many different colors injures its overall continuity. But "Monet's Pond" in real life seems to have the same problem IMHO. Pretty but busy. Love the Lotus Flower though. The lotus definitely attracts the eye. I'd love to see a version with a more muted lotus, so that it's darker overall, and so the other plants aren't "outshined". Than you fro creating such fine arts. This is flat beautiful! Solid 10! Thanks! OMG, I LOVE this background!!! Things just keep getting better and better with you! Like pretty much everything you do, this one's really awesome. I totally agree that we could all use more serenity these days and I can't wait to get it on my desktop. Thanks! Completely agree with Tyler. You have been pushing some of your best work as of lately & fast as hell too! This one will be on my desktop for a long time. Well at least until your next one. Only suggestion, I was looking at your inspiration could you add a koi fish or two. Just for a little life. I don't comment that much but had to on this one, this piece is beyond killer. Makes a crazy awesome background. Top notch this is, a solid 9 if not a 10! To me, this feels like a new variation of Haiku. Love it! "You are a leaf on the wind!" Very well done, this with some relaxing tea and some deep breaths can really calm down a hectic day. Thanks! You're on a roll, you're red hot dude. I mean damn just the last few pieces alone are ranking among your best. What changed? You hire a muse or something? Listening to more EDM?? 2017 is on course to be one of your best if not the best year of your career. I am absolutely floored at the quality and frequency you are putting out this year. Being a member has never been better spread the word everyone! !